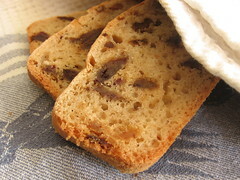 Date Nut Bread - Do You Know The Muffin Man? Notes: I made this bread dairy-free by substituting almond milk. This is another recipe from this book that doesn't use the plain GF flour mix, but a different proportion of brown rice flour, potato starch and tapioca starch. So much for premixing a big container. I used Medjool dates and toasted walnut halves. Although I didn't need to bake it for an extra 15 minutes, I wasn't sure whether a few crumbs sticking to the toothpick meant it wasn't quite done yet. This was quite tasty, with a slightly dense, spongey texture.